A firm that offers the world’s most environmentally-friendly range of bike lubricants and maintenance products has scooped a Green Apple Gold Award – one of the most prestigious environmental accolades a business can receive. Green Oil, based at our Shakespeare Business Centre in Brixton, was founded by entrepreneur and keen cyclist Simon Nash five years ago, and is continuing to expand its product range as well as experiencing business growth. Simon came up with his business idea after cycling through a river and worrying about his chain oil polluting the water. When he could not find a ‘green’ chain lubricant on the market, he set to work putting his high school chemistry knowledge to good use, and launched his start-up business in a garden shed. All bottles are made from plastic that is collected from local authority recycling bins and the company uses recycled mailing envelopes for its online shop. Products are also stocked by a range of retailers. 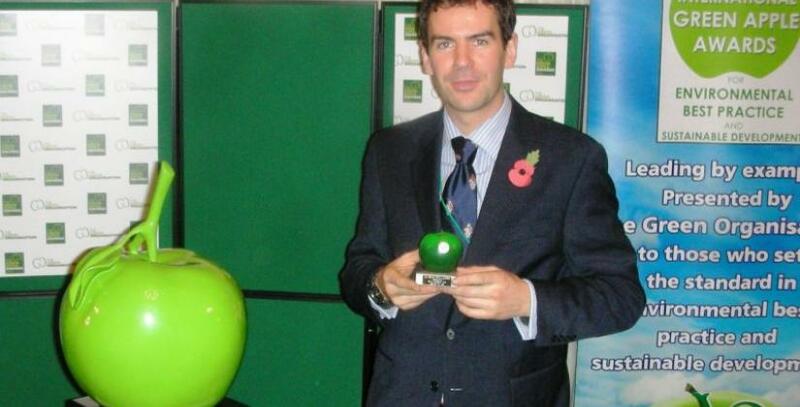 “I decided to apply for a Green Apple Award because I strongly believe we uphold and represent the highest environmental standards, as well as supplying unique products,” Simon said. “I got a letter to say we had won, but the grading of the award – gold, silver or bronze – wasn’t revealed until the ceremony, which took place in Parliament. Simon has been a Bizspace customer since early 2012, after becoming frustrated with a previous landlord. He says the flexible working conditions, simple paperwork, convenient location and business centre facilities are what attracted him to the Shakespeare Business Centre. “The business centre itself is a really cool space, having been developed from an old granary, and it is a real bonus to be so close to bars and restaurants and to have the community room here with a table tennis table,” the young entrepreneur said. Search online to find your nearest Bizspace site.